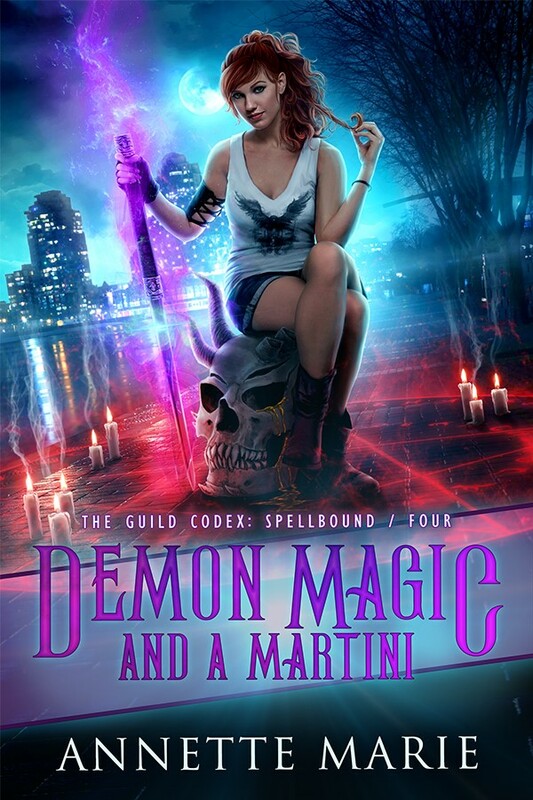 Hi everybody, and welcome to the official cover reveal of Demon Magic and a Martini, the fourth book in the Guild Codex: Spellbound series by Annette Marie! This cover reveal is hosted by Xpresso Book Tours. Well, here we are AGAIN with another Annette Marie post! (#sorrynotsorry) I’m sure I already told you that I love Annette Marie’s books and have subsequently raved about the writing, the worldbuilding, the pacing, the character development or romance aspects of her books, but something I tend to rave less about are the covers and that’s a shame because they are GORGEOUS!! This new cover is no exception, and I’m having trouble deciding which one I love more, the Two Witches and a Whiskey one or this new one. Which Annette Marie cover is your favorite? Check out the full cover for Demon Magic and a Martini below and while you’re at it, be sure to check out her books, including this lovely Guild Codex: Spellbound series. Oh I love how the surface slants!! It adds such great dimension to the cover. Ooo, nifty covers! Hard choice…. I *love* the little dragon on the cover for Two Witches and a Whiskey, but this feels slightly more… balanced. Descriptive. And I love the staff magic. I’ve not read the Guild Codex series, or anything by Marie, but this does sound lovely. Reminds me of one of my favorite urban fantasy series — the Dresden Files by Jim Butcher. I totally, totally recommend that series if you’re into this type of thing! It’s a long one, with 15 books and counting, but it’s got wonderfully-sarcastic humor and great characters, with an entertaining take on magic in a modern setting. You have a beautiful blog here, Lindsey! I love love love that cover. It’s begging me to learn more. I’m actually not familiar with the author and as a YA speculative fiction fan, I should probably check her out!